Last October I had a very inspiring visit at the Roro Art studio in Toronto. My friend Robin's sense of organizing space is the best I've ever seen. The amount of supplies, tools, final products and resource material that she can fit in a single space is incredible. Knowing I could improve in my own "studio with a bed in the middle", I started making some tweaks in terms of moving furniture around, decluttering and getting rid of things I no longer needed. No, REALLY, I had to be stern with myself, and a lot of "my PRECIOUS" and "I'll need that someday" had to go. Thankfully, the parting is virtually guilt-free, as a lot of my neighbors are recyclers. Whatever I put out on the curb that might, even remotely, have some kind of utility left in it, gets appropriated within two or three hours, usually. Weirdest quick disappearances so far: a pair of DESTROYED studio sneakers, and a very uncomfortable mattress. This week, in between steps in two different contracts, I spent a lot of time and effort on that studio makeover. I LOVE it! My biggest investment and improvement came as a purchase of a used industrial shelving system (200$). That beautiful behemoth thing allows me to store most of my supplies in one room, but it does take HALF the room. Seeing how wonderfully deep and wide that middle shelf was, I decided to use it as a work table. finally, a space big enough to pattern and cut my fabrics, without having to put a board over my bed. That meant that more than a third of the shelving's storing power would be immediately eliminated! That wouldn't do! I figured I could find some shelves I could install on the back wall, between the bottom shelf and the top one. Easier said then done! But the idea of using milk crates has been floating in my head since my Roroart visit, and today I implemented it. WOW! The table space that 7 maskmaking bases used to wastefully occupy, now provides residence to those same bases, and so many more items, including items that were stored elsewhere. I have better storage, and MORE SPACE! I love the milk crates so much I'm getting more this week. I want to build an l-shaped mobile tool station, to hold my tool bucket, a tape dispenser, with a wooden table top to hold my crock pot (for warming my oil-based clay). The crates are held together with big tie wraps (zip ties), which means they can easily be re purposed in the future. For sturdier assembly, I'd use nuts and bolts with washers. For those who have not had the pleasure of interacting with milk crates, they are quite common in North America. They are sturdy plastic square crates that are used for delivery of milk and other items to grocery and convenience stores. Countless artists, handypeople, and cyclists have adopted them for their own uses. You can get them for free sometimes, but in my area, I have to buy them from the store, as they have a consignation price on them. They have to pay the supplier for each missing crate, so I buy them at that price, which is 4$. 4$ for a magical item that has the convenience of a thousand uses! 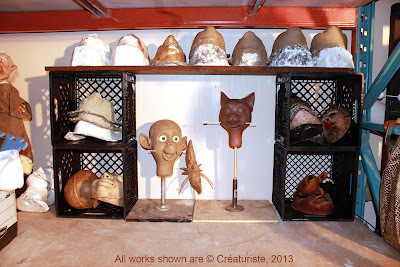 I'll update this article with more tips and pictures of what I've done in my studio soon. I've a preference for oil-based clay, since it suits my technical needs the most. Still, water based clay is unbeatable for certain tasks. Ideally, one would be equipped and have a studio setup to use both clays, but when a choice must be made for one of the two, having the following information is certainly helpful! 18 inch tall WED clay head. VERY SMOOTH. My design (drawing), main sculpture by Jean-Pierre Busque, detailing and refining by me. 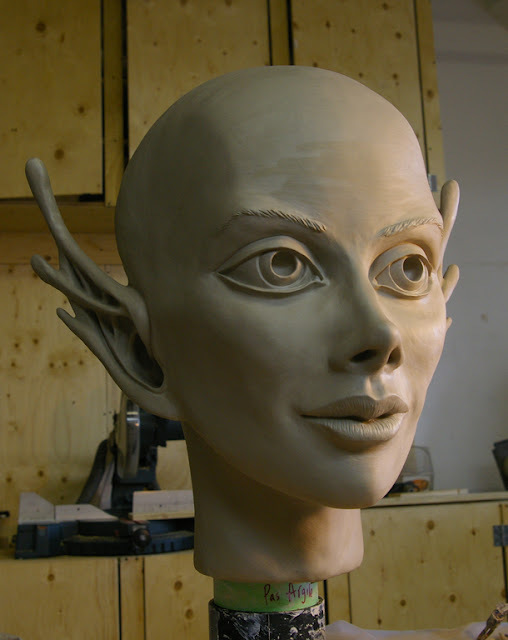 Waterbased Clay can be sculpted FAST, and smoothed even faster. With water and sponges and brushes. No toxic solvent, no flame required. It can be re-smoothed later, when it has become firmer. It can be made flawlessly smooth. My favorite is Earthenware. It's amazing! It's alive, it's MAGICAL! Except it has its drawbacks. MAJOR drawbacks for some. It dries, therefore it can crack, it can fall off the armature, and work has to be redone. This can be prevented of course, by spraying water as one works (not too much! ), and by keeping the sculpture protected by moist towels covered with a plastic bag, until the next work session. Wash and replace towels every few days. Waterbased Clay dries our hands as we work with it. Use a good hand cream after every hand washing, and take breaks occasionally. It produces dust. A lot of dust. The mess goes everywhere as you walk away from your work station. And, you are breathing it in. Silica is not something you want in your lungs. I got sick from it when I was in College, because I was sculpting in my bedroom. NOT a good idea with dusty materials. Waterbased clay becomes harder and firmer as it dries, which is a necessity if you want to fire it in a kiln and get a ceramic sculpture. But this same property becomes the enemy of the worker of fine, thin details. Small fingers for example, will dry faster than the rest of the sculpture, and provoke a lot of frustration. When you need to sculpt an action figure or a puppet with moving parts to be reproduced later by the use of molds, waterbased clay is not the usual choice. You can re-use this kind of clay if you keep it clean and moist, but protect it from contamination by products and dust, to prevent mold from forming in it. For long term storage, let it dry, and store in a container. Re-moisten in a large bucket, DAYS before you plan on re-using it. My favorite type of waterbased clay: WED clay. It dries a bit slower than other clays, thanks to its glycerin content. I don't have any at the moment, as it is not available in a local store, but I plan on getting some again someday. In the meantime, a locally-made earthenware does what I need, which these days is making clay walls for making molds over my oil-based clay models. Because oil repels water, the two clays don't merge, and keeps my sculpt clean during the process. Oil-Based Clay, aka Plasticene or Plastalina, takes a long time to smooth, but that's the only major disadvantage I can find about it. A good quality Plastalina is firm at room temperature, and can be left on a shelf for YEARS without damage to it, as long as it suffers no physical attack. Cover to protect from dust, keep way from heat sources and the sunlight, and that's it. No drying, no cracking, as long as it's not on a porous surface or armature. Because it is both firm and relatively pliable at room temperature, it can be used in very thin applications, without cracking. The firmer plastalinas can be used to make a sculpture in multiple parts, with articulations worked into the model. This is especially useful for making action figures and even static sculptures meant to be molded in a more practical approach, for easier reproduction and assembly. Smoothing can be done easily with solvents, but those are toxic and I avoid them whenever possible. My current "solvent" of choice is rubbing alcohol (70%), with a small amount of mineral oil, to prevent the formation of dust when rubbing the sculpture. It's not perfect as a smoothing method, it takes a lot of time and repetition. For the rare times i needa really smooth finish, I'll use a strong solvent, and apply it outdoors. A tool I cannot sculpt oil-based clay without is the alcohol torch, by Buffalo. And despite some instructions warning us to use only 100% ethyl alcohol, I've always used Methyl Hydrate with success. It is easily found in hardware stores, and is much more affordable. 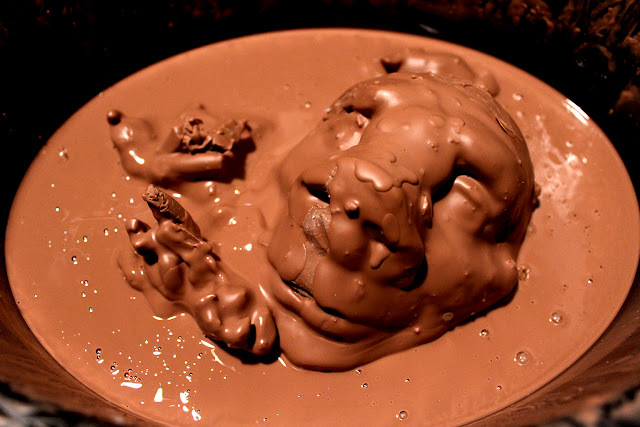 Because of its wax content, this type of clay can be made temporarily firmer by freezing it. It will retain the cold for a while, and the harder surface can be smoothed and detailed with further fine control. I sue this to detail eyelids and final textures. My favorite clay these days: Monster Clay , by Monster Makers. It melts easily in the microwave oven and in the crock pot, it shapes wonderfully well, and is not tacky against fingers or tools. The smell is faint and pleasant, and the light brown color reveals details easily, and looks good on photographs. The clays I used and liked previously: Chavant NSP Soft(tan color), and Prima Plastalina. An old model made from Monster Clay, melting in a crock pot. Advantages: Sculpts fast, smooths fast and perfectly, is reusable, can be fired as a permanent ceramic sculpture. Disadvantages: messy, dusty, dries and cracks. Advantages: sculpts relatively fast, does not dry, firm and stable at comfortable room temperature, can be worked in a harder state if frozen, is reusable. Disadvantages: takes more time and effort to smooth, and requires a mold to be made to make a reproduction as a permanent sculpture. Monster Clay sculpt, with wood eyes and teeth. Teeth will be removed for mold making step.